Group pages are free to create, permanent and searchable by location and categories. They are highly recommended if you’re hosting a regular group, meetings, classes or to use as your home page on the site to display all your events. Members can join your page and participate in your forum and automatically get notified when you add new events or posts. Add content about your services or events you’re hosting. Members can join your group, allowing you to stay in touch with them and engage with your audience. 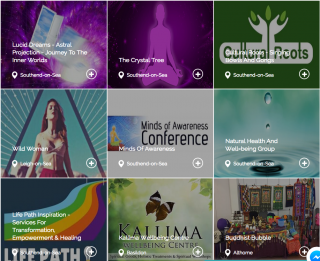 If you wish to fully promote your spiritual or holistic services it’s best to create a dedicated Group page as these are fully searchable. For example, all users have a single profile page which isn’t searchable, however, users can create one or multiple group pages. You can then use a group page as your main dedicated home page on the site and then attach any events related to that group you’re hosting to it. For example, you might want to create a yoga group and only add yoga events to it, then create a meditation group and only add your meditation groups to that. Each group page has it’s own forum, location, description and members.